Is David Savard a top-pairing defenseman? Not yet, but he could be. 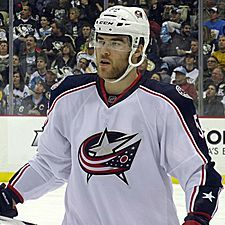 It is true that Savard played alongside Jack Johnson to form the Columbus Blue Jackets top defensive pair. But just because he gets the minutes, it doesn’t mean that he is ready for them. Recently Aaron Portzline of the Columbus Dispatch quoted Ray Ferraro about the Blue Jackets defense in an article that can be found here. That quote sums up the Blue Jackets defensive situation. Right now, Savard is a great third or fourth defenseman. Columbus isn’t doing him, or the team, any favors by forcing him into a role that he is not currently suited for. In the “advanced stats” community Savard hasn’t impressed. In 2013-14 his 5-on-5 Corsi For % was sub par at 47.5. In 2014-15 he did not improve with a 46.8 despite playing on the “top unit” for half of the season. In 2014-15 Savard scored a career high in goals (11) and points (36), which is nice, but goals aren’t everything, especially with a defenseman. Over the last three years, his possession impact has been dreadful as shown in the above HERO chart. Savard’s Relative Corsi was -0.5 and -3.0 for the last two years respectively. This indicates that the team had better possession numbers when he was not on the ice as opposed to when he was on it. Not really what you want to see from a top defender. Despite the fancy stats, Savard has made obvious progress. He has discovered an offensive touch, and will be a fixture on the power play. He now has top-pairing experience behind him, and will only continue to develop with more responsibility. While Savard did have poor possession numbers, so did the entire Blue Jackets team. The overall Columbus Corsi was 47.3. That’s not a large departure from Savard’s individual numbers. There was a ton of upheaval on the blueline last year. Ryan Murray missed most of the season and James Wisniewski was traded. Many players were forced to play roles, and minutes that they would not normally be asked to play. Simply a recipe for disaster. The Saint-Hyacinthe native will benefit from a healthier, more consistent team. Having a healthy Ryan Murray will have a huge impact on not only Savard, but the entire Blue Jackets squad. Savard is a young, skilled player with an offensive side and grit to his game. Columbus was wise to lock him up to a long-term contract, and will likely be rewarded for their foresight. If the Blue Jackets are to have any success in 2015-16 and beyond, Savard will need to be a big part of it.